A soldier stationed at Fort Bragg was reportedly shot and injured outside his Fayetteville apartment Saturday, October 15, 2016. 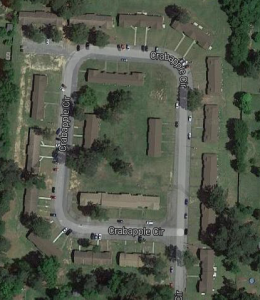 According to The Fayetteville Observer, “the soldier was sitting outside his apartment on Crabapple Circle, in a neighborhood off North Reilly Road near Fort Bragg, when two men approached him and started talking.” The suspects apparently produced handguns and attempted to rob the victim once once he turned to go inside his home. The soldier was transported to Womack Army Medical Center with a gunshot wound to the leg, per media reports. How did the gunmen gain entry to the property? What security measures, such as bright lighting, gated-entry, fencing, security patrols, and surveillance cameras, were in place to deter crime at the time of the shooting? October crime reports, from Spotcrime.com, reveal a number of recent assaults and burglaries in the surrounding area. Was the apartment complex aware of any prior criminal activity on or near the property? If so, were additional security precautions implemented by the property owner or management to protect residents? Generally, property owners are required to protect all residents and guests legally on the premises from any foreseeable harm. Based upon its prior successful experience in handling security negligence claims on behalf of victims and their families, The Murray Law Firm suggests that photographs and a thorough, unbiased inspection of the property will need to be performed immediately, before any evidence may be repaired, damaged or destroyed. Given the complexities of pursuing a negligent security case, it is imperative that the victim retain an experienced attorney who can ensure the preservation of any and all evidence that may support such a claim.